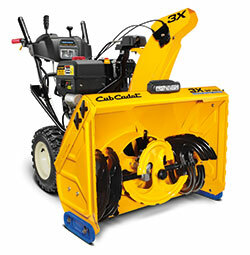 Cub Cadet released a new line of professional-grade snow throwers. The Cub Cadet 3X Series uses a three-stage system to plow through snow up to 50 percent faster than a traditional Cub Cadet 2X two-stage snow thrower. The 3X Pro performance is boosted by 14-inch augers, 14-inch impellers, steel ball bearings and 12-gauge steel side panels. The 3X Pro line features 30- and 34-inch clearing widths with 23-inch intake height. Both are available with hydrostatic transmissions. The unit also includes an integrated LED light bar, heavy duty steel chute, cool blue skid shoes, sealed ball bearing designs on augers and wheel shafts, trigger-controlled power steering and a Cub Cadet 420 cc OHV engine with electric start. Comfort features include heated hand grips. The line features a one-year limited commercial warranty, a three-year residential warranty and a five-year auger gearbox warranty.